Witches’ brooms on blueberry are caused by the rust fungus Pucciniastrum goeppertianum. They are more common on lowbush blueberry but also occur on highbush varieties. 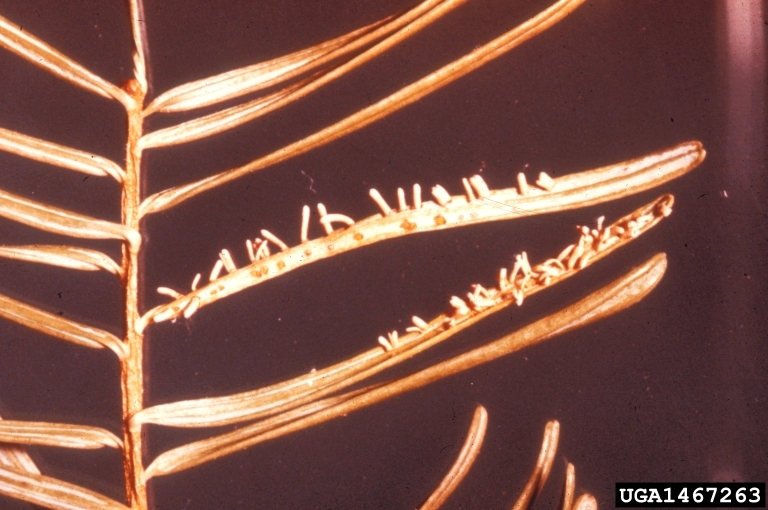 The alternate host for this rust is the balsam fir, on which it can cause yellowing and needle cast. Witches’ brooms begin as dense bunches of leafless, fruitless, spongy young shoots. They are reddish in color at first and then turn tan or brown. Shoots may be shiny but eventually become dull, dry, and cracked. 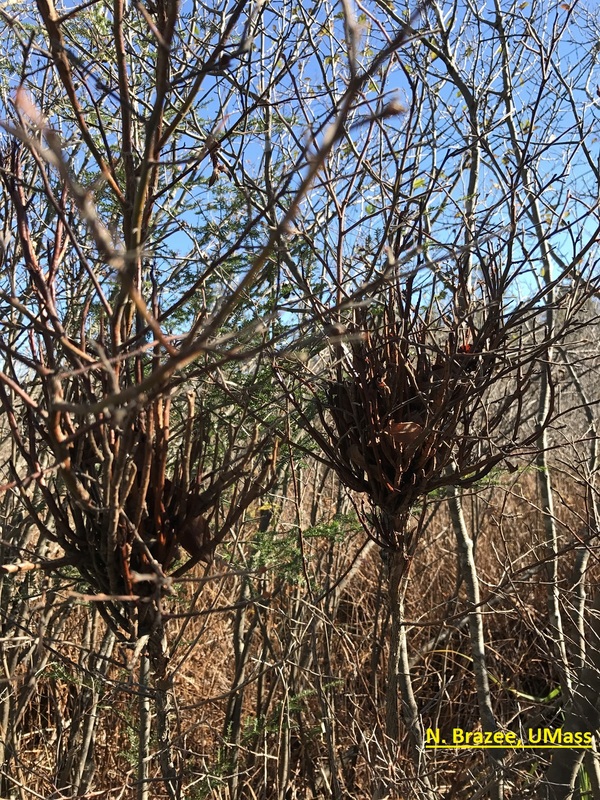 Canes infected with witches’ broom produce little to no fruit; the remainder of the plant may still produce fruit but will become less productive over time. Infected blueberry shoots produce basidiospores in spring. These travel on the wind to balsam fir, where they infect new growth. Aeciospores are then produced on infected needles, and wind transports these spores back to blueberries. The infection becomes perennial and systemic in blueberry plants. The characteristic witches’ broom does not appear until the next growing season. In the fall, teliospores are formed on infected tissues. These will give rise to new basidiospores the following spring. If they are not removed, brooms may persist for several years and continue to produce basidiospores. Remove the entire branch the witches’ broom arises from. The disease is systemic, and if it has not yet reached the crown, other canes may yet escape infection. If the plant continues to produce witches’ brooms it should be removed completely. Removal of balsam fir from the vicinity would be helpful but is seldom practical. Blueberry cultivars differ in tolerance to this pathogen: ‘Rancocas’ is known to be somewhat tolerant. There are no effective fungicides for management of this disease.